The Barnstormers were once again successful in overcoming the opponent on the road defeating the Battle Wings 48-42. The Battle Wings struck first in the game on a 40 yard touchdown pass. After two Todd Blythe touchdown receptions and one touchdown that Ryan Vena took in himself all before the final minute of the half the barnstormers took the lead by a touchdown. The Battle Wings were able to score once more in the final minute of the half to bring the game back to a tie. The Barnstormers defense tallied two blocked kicks, one field goal and one an extra point on two of the final three Battle Wing possessions in the first half. Jeff Glas attempted a field goal in the final seconds, but was short and the Battle Wings took advantage of the opportunity returning the kick to score a touchdown and take the lead going into halftime 28-21. The Barnstormers defense kept the game rolling with two more interceptions in the third quarter to continue to push the offense ahead. The Barnstormers continued to trail throughout the second half but in the final minute of the game the Ryan Vena was able to find Todd Blythe and get into the end zone while the defense was able to hold off the Battle Wings in their final possession of the game and the Barnstormers came out on top 48-42. 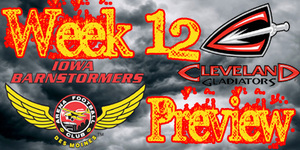 The Barnstormers continue their road trip this weekend as they head to Cleveland, Ohio to take on the Gladiators. The Barnstormers are seeking revenge on the Gladiators after their home loss back in May 56-70. Cleveland has been an up and down team this year, starting off with a three game losing streak and then went on a three game win streak followed by a two game losing streak once again. They have also been a back and forth team with the Barnstormers in the AFL standings. Cleveland comes into this game with a record of 4-6, taking a beating last week from Milwaukee in their loss 54-82. Iowa Barnstormers @ Cleveland Gladiators will be broadcast LIVE on 1700 AM The Champ, on the Internet at www.theiowabarnstormers.com and at www.nifty-tv.com. -Leading Tackler: Carlos Campbell (#4) - 10 GP, 70 tackles (48 solo, 22 assisted), 2 interceptions for 16 yds, 2 forced fumbles, 6 pass breakups. Brent Curvey has been a danger standing on the defensive line all season for the opposing team. In this weeks game Curvey caused the forced fumble that was the recovered by fellow Barnstormer Khalil Carter and resulted in the final touchdown of the game to pull the team ahead of the Battle Wings. This is not the first forced fumble that Curvey has caused that has lead to a touchdown. In the victory against Oklahoma City Curvey forced a fumble that Micah King recovered and ran in for a Barnstormer touchdown. Curvey is always putting great pressure on the opposing quarterback and has assisted in many of the Barnstormer sacks against them.